The greatest improvement in the bow was attained by the Frenchman, Tourte, at the end of the 18th cen�tury. His bows possess the greatest elasticity and firm�ness, and are, in consequence, the most successful. After Tourte, Vuillaume in Paris, John Dodd in England, and L. Bausch in Leipsic, have made the best bows. At present the most celebrated bow makers are Tubbs in London, Knopf in Dresden, and Voirin in Paris. 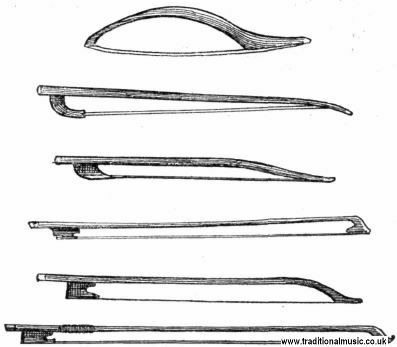 French bows are most in request, although many of them are made in Germany, sent en gros to Paris, stamped there as French, and issued to the world as of Parisian make. Constituent parts of the bow. These are (a) the stick, (b) the hair, (c) the nut, (d) the screw, (e) the head or point, (f) the lapping. Schroeder, Catechism of Violin playing.